On 9 September 1999, shortly after midnight, a bomb exploded on the ground floor of a nine-storey apartment building at 19 Guryanova Street in south-east Moscow. Ninety-four people were killed and 249 injured. 108 apartments in the building were destroyed. Nearby buildings were also damaged. The bombing on Guryanova Street followed an explosion in the Okhotny Ryad shopping mall on Manezh Square in Moscow (31 August) that killed one and injured 40, and outside an apartment building in Buinaksk, Dagestan (4 September) that killed 64 and injured 133. 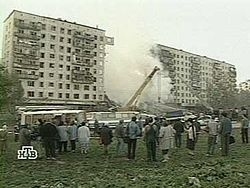 Subsequently bomb attacks took place in the basement of an apartment buidling on Kashirskoe Highway in south Moscow (13 September 1999) killing 119 people and injuring 200, and outside an apartment building in Volgodonsk, Rostov region (15 September) that killed 17 and injured 69. On 22 September what appeared to be a planned attack on an apartment building in the city of Ryazan was prevented by local residents and police. However, on 24 September, FSB director Nikolai Patrushev announced that the apparent attempt to plant a bomb had been an FSB training exercise to test responses following the earlier attacks.